High total cholesterol levels in your blood increase your risk for heart disease. You produce cholesterol in your liver and obtain it from eating meat, poultry, eggs, dairy and other foods. Lowering your blood levels of total cholesterol and LDL cholesterol and increasing HDL cholesterol through a healthy diet may reduce your risk for heart disease. Consult your doctor about your cholesterol levels and best dietary treatment approach. Vegetarian meal plans vary widely. Vegetarians eat predominantly plant based foods. Vegans eat a variety of fruits, vegetables, nuts, seeds, grains, legumes and sprouts. Lacto-vegetarians eat plant foods and also eat a variety of dairy products, such as yogurt, milk, cheese and sour cream. Lacto-ovo-vegetarians eat plant foods, dairy and eggs. 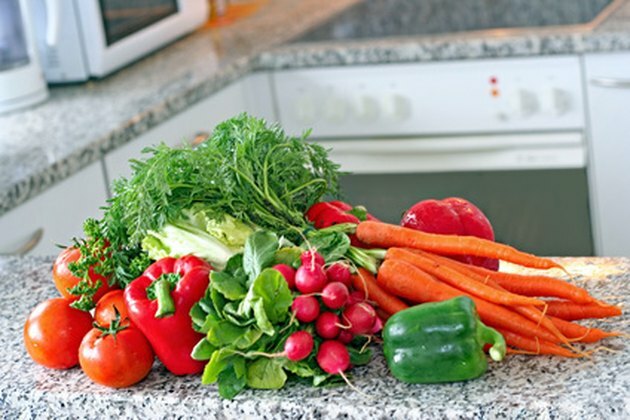 A vegetarian diet may reduce your cholesterol levels and lower your risk for heart disease. Research by Simone Grigoletto De Biase published in "Arquivos Brasileiros de Cardiologia" in 2007 discovered that compared to an omnivore diet, a vegetarian diet was associated with lower blood levels of total cholesterol and LDL cholesterol and a higher ratio of HDL to total cholesterol. The research demonstrates that a vegan diet achieves beneficial changes in cholesterol levels. Switching from an omnivorous diet to a vegetarian diet increases HDL cholesterol, the good cholesterol, by 21 percent, according to research by F. Robinson published in the "Journal of Human Nutrition and Dietetics" in 2002. One common misconception is that a vegetarian diet does not contain cholesterol because it does not include meat. However, many vegetarians may consume eggs or dairy, which are high in cholesterol. Plant-based foods may contain negligible amounts of cholesterol and trace amounts of saturated fat. Another misconception is that vegetarian meals do not contain a sufficient amount of protein. Yet vegetarians who eat eggs, dairy or soy products can consume sufficient protein. Vegans can get sufficient protein by consuming nuts, seeds and legumes. Two things to consider when planning your vegetarian meals are choosing between raw or cooked foods and between organic or conventional foods. Raw foods are not processed or cooked and have a higher concentration of nutrients than the same foods when cooked. Organic foods do not contain harmful chemicals, such as herbicides, synthetic fertilizers or pesticides, and are not derived by genetic modification. Research by Walter Crinnion, N.D., published in "Alternative Medicine Review" in 2010 reports that organic foods have higher levels of nutrients and greater antioxidant activity to protect you from environmental chemicals, cellular mutation and cancer cell proliferation, than nonorganic foods. What Are the Benefits of Organic Brown Rice?